There's much to love about the animated film, Finding Nemo, but one of many treasured moments is the frenzied fish in the dentist's aquarium, who is enthralled with the toy sunken treasure chest. Said chest pops open at regular intervals, releasing a stream of bubbles into the water, sending the little fish into paroxysms of delight: "Bubbles! Bubbles, bubbles, bubbles!" (He's listed in the credits as being named "Bubbles.") The scarred, jaded, former ocean-dwelling fish, Gill, shakes his head sadly at the sight, and comments to Nemo on how the unnatural state of prolonged captivity for fish can have severe psychological effects: "It does stuff to you, kid." Still, the scene captures the essence of human fascination with bubbles in any form. Blow a few bubbles through a plastic wand in front of any three-year-old, and you'll get a similar reaction: "Bubbles! Bubbles, bubbles, bubbles!" Everything's better with bubbles. We like thick, rich shaving foams, salivate over meringues and mousses, consume carbonated beverages by the truckload, and about a million pounds of Reddi-Wip every year, thrilling to the "whooshing" sound it makes coming out of the can. A dearth of bubbles may even offend our aesthetic sensibilities. When I gave my sister-in-law some all-natural shampoo for Christmas a few years ago, she said she liked the scent, but missed the rich foam of her favorite commercial brand (courtesy of being chock-full of chemical surfactants). As a good friend of mine, fond of long, luxurious soaks in the tub, once put it: "There's something so naked about bathwater without bubbles in it." Bubbles are no less alluring from a physics standpoint. They're round, at least when they form initially, because that's the shape with the minimum surface for any volume. Surface tension arises from molecular attraction. The greater the surface area, the more energy that is required to maintain a given shape. Bubbles have a very laissez-faire philosophy when it comes to their preferred geometry: they want to assume the shape that requires the least amount of effort, and therefore the least surface area: a sphere. But bubbles in a foam coarsen over time as the pull of gravity yanks the liquid downward. The "walls" of the bubbles become very thin as the amount of liquid decreases, so much so that smaller ones are absorbed by larger bubbles. Over time, the bubbles start to resemble polyhedron-like soccer balls -- still roughly spherical, but not a perfect sphere. Furthermore, bubbles don't resist outside pressure very well; they bend and adapt, taking the shape of any container that confines them. Which makes them very difficult to study, frankly. An American botanist named Edwin Matzke did his best, actually building foams in his laboratory bubble by bubble so he could better examine their cellular structure -- he was looking for insights into how plant cells pack together, apparently. The jamming phenomenon is what makes bubbles so rigid, despite the relative percentages of their components (liquid foams are about 95% gas and 5% liquid). Glynn Holt of Boston University got around that particular problem by levitating individual bubbles with acoustic waves (sound), so there was no need for any kind of container. Now, it seems, bubbles need not be spherical, even in the absence of the usual outside forces. They can be manipulated into the laboratory to make other pretty shapes, like peapods, doughnuts, sausages, and who knows what other kind of shapely foodstuff. At the APS March Meeting in Denver -- yes, it's more news from last month's conference that I am only now finding time to blog about; I'm in the midst of a major move, folks, and it's really cutting into my blogging time -- Howard Stone (Harvard University) reported that he has figured out how to build stable bubbles in new shapes by creating a special coating, or "armor," for ordinary gas bubbles out of a tightly packed layer of tiny colloidal particles and then fusing them. The particles are jammed, but not bonded, according to Stone, which means the bubbles can be reshaped and molded at will. Okay, we've been using particles to stabilize emulsions and foams for over 100 years; the improvement here is that the bubbles last longer to produce stable non-spherical shapes. And there could be any number of payoffs, Stone says, because bubbles are engineered into so many consumer products, from new kinds of microscopic packaging for chemicals and better drug delivery systems, to new textures for ice cream and shaving foams. Stone can create these armored versions one bubble at a time thanks to advances in microfluidics. Microfluidics is all about the control and manipulation of teeny-tiny amounts (on the order of micro- and nano-liters) of fluids, which flow through etched microchannels. At that size scale, fluids don't behave the way they do at the macroscale, because things like surface tension, energy dissipation and flow resistance -- usually not decisive factors -- begin to dominate the system. So control is generally gained by employing a series of external valves and pumps. Such systems are particularly useful in building biochips, like DNA microarrays, or lab-on-a-chip assays, because it's possible to integrate several different functions on the same chip. Ultimately, scientists in this area hope to create highly integrated, portable, clinical diagnostic devices for home use, cutting down drastically on time-consuming and expensive laboratory analysis. 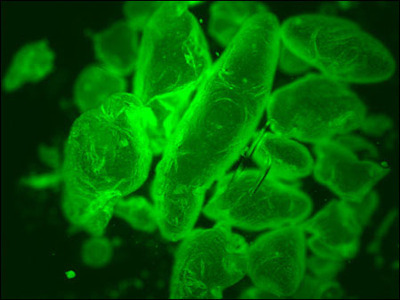 In the case of lab-on-a-chip assays, such devices may rely on bubbles to carry samples and reagents, or they will use bubbles to control the flow of various components. Now MIT researchers are building rudimentary bubble-based logic devices. I mentioned the work in passing last November, but at the recent Denver meeting, Manu Prakash was on hand to give an update; he's a graduate student under Neil Gershenfeld, director of MIT's Center for Bits and Atoms. What kinds of bubble devices? you may well ask. 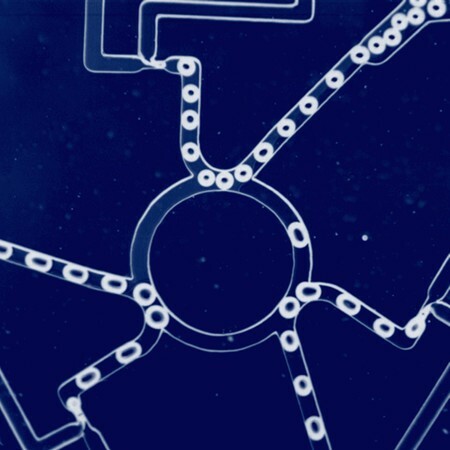 They've built an entire family of chips modeled on the architecture of existing digital circuits, that mimic the functions of electronic components: logic gates (AND/OR/NOT), memory, and even a microfluidic ring oscillator constructed from three AND gates (shown). Unlike conventional electronics, though, Prakash and his colleagues don't use high and low voltages to represent a bit of information. Instead, they use the presence or absence of a bubble. This means that a bubble can not only carry some kind of payload -- say, a therapeutic drug, or chemical reagents -- it can also carry information at the same time. Prakash summed up the significance thusly: "Now you can program what's happening inside the lab on a chip, by designing bubble logic circuits that function just like their electronic counterparts." In other words, bubble logic merges chemistry with computation. The devices aren't going to rival conventional electronics in terms of speed of operation: MIT's bubble chips are 100 times slower than your average microprocessor. But they don't need to be as fast as the average microprocessor. Prakash and his colleagues have achieved operation speeds 100 times faster than the external valves and control systems currently used in microfluidic chips -- certainly a significant improvement in a technology that has already found a wide range of practical applications. The most immediate use of MIT's bubble chips would be to control chemical reactions, according to MIT's press release describing the research. Among other uses, they could enhance the memory capabilities of microfluidic chips: thousands of reagents could be stored on a single chip -- much like conventional data storage technology -- employing counters to dispense exact amounts, and built-in logic circuits to deliver the reagents to targeted spots. They could also be used to sort biological cells in assays, and to make programmable print heads for inkjet printers, for example. There was one more bubble-icious paper at the Denver meeting, courtesy of Bogdan Dragnea of Indiana University in Bloomington, who builds virus-like molecular cages. Dragnea's artificial viruses lack the hazardous genetic core of living viruses. The human immune system can't tell the difference. The obvious question, which he wisely anticipated in the press conference, is why we should be interested in making artificial viruses when the real things are raging out of control and causing all kinds of health problems and fatalities in the human population (not to mention avian or animal populations). He believes his approach could lead to novel biomedical imaging methods and sensing tools, and possibly even new materials at the molecular scale that mimic the virus structure. The concept shares some elements with Stone's armored bubbles. The technique came about a few years ago, when Dragnea and his cohorts figured out how to embed gold nanoparticles inside viral capsids via a complicated self-assembly process that relies on the attraction between the negatively charged gold nanoparticles and the positively charged proteins lining the capsids. In science, opposites really do attract, and Dragnea's process mimics the interaction between "anionic genetic contents" and the "cationic protein coat" in real viruses. Last year, they extended that work to surround fluorescent quantum dots of cadmium selenide crystals, encased in a shell of zinc sulfide. Because the dots glow for an extended period, they can be used to track how long it takes for a particular virus to travel across a cell membrane, and/or what route a virus takes through the body. The initial studies were based on a well-understood plant virus (the brome mosaic virus, or BMV), and the plan is to extent the work to more clinically relevant viruses -- right now the focus is on alpha viruses, which are responsible for many mosquito-borne human diseases. Ideally, the goal is to replace vaccines -- made from actual viruses -- with completely artificial versions, dispensing with the risk of real-virus vaccines sometimes causing an outbreak of the diseases they're designed to prevent. See? Everything's better with bubbles, regardless of whether it's dessert, personal hygiene (or personal indulgence, in the case of bubble baths), lab-on-a-chip bubble logic devices, or artificial viruses in vaccines. Reflect on that next time you're enjoying a long soak in the tub, or savoring a huge fluffy mound of Reddi-Wip on your serving of pumpkin pie. Love your writing and your approach; and I'd like to invite you to attend Light in Winter in Ithaca next January. Fifth anniversary of unique science/art festival. hopefully would be a good venue for next book launch; in the meantime, I think you'd enjoy the weekend, especially "Imagined Identities: the physics of superheroes and the biology of B-movie monsters" with Kakalios and LaBarbera. In any event,website at www.lightinwinter.com has all the infor. Not to mention that real bubbles some times behave like black strings in 5 dimensions!!! for a little more physics, see F. Weinhaus and W. Barker, On the Equilibrium States of Interconnected Bubbles or Balloons, American Journal of Physics, Vol. 46, No. 10, 978 - 982, 1978. Don't forget the wonderful shapes that bubbles make in geometric frames. I have had the pleasure of demonstrating surface tension in the Platonic solids with soap films and bubbles. They even delight the grown up math and science teachers who make up my audiences. Soap bubbles make a great crossover subject as they can teach math, physics, biology and chemistry. It is easy to convince the audience that they are in fact a bunch of bubbles walking around. Greetings. I'm a writer, photo editor and researcher working on a story called "4 Ways of Looking at a Bubble." As I searched various photo agencies for interesting images of bubbles and their various roles in our lives, I found fabulous image of Edward Teller, (with Hans Bethe), blowing bubbles in his laboratory with bubble diagrams on a blackboard in the background. Unfortunately, the caption info for the photo says nothing about why bubbles would have been used in experiments that led to the development of the hydrogen bomb, and that's just the sort of information that I need in order to write the text to accompany the photo of Teller and Bethe. Might you, or anyone else our there, be able to give me a quick, layman's rundown on how bubbles fit into the H-bomb studies? Many, many thanks for any help!